This is just a few of my favorite "new" beer blogs. The first is called BeerGeekUSA and it's written right here in Madison, Wisconsin by UW chemical engineering student Victoria. Yay! Another beer writer in Madison! There are not nearly enough girl beer writers in the universe. Craft beer, somewhat surprisingly (to me) has more female drinkers than you might think. Unless you're a girl. Then you probably think there are quite a few girl beer drinkers who simply get drowned out by moron boys yelling loudly at each other about silly things like IBU and Cascadian Dark Ales and any number of other stupid "debates" that have raged. This is an overlooked and under-marketed class of consumers that can and will become a powerful force in the growth of the industry. That she's a Chem-E student makes her musings that much more intelligent than mine. Hmmm...maybe I should hire her and eliminate the competition. The second is another female "blogger" who "writes" a "blog" called Pints and Panels. I met "M" (Emily) at Great American Beer Fest last year; she was a blast and definitely has a different take on beer and blogging. For one, she doesn't write so much as draw her blog. She's a cartooning student. Cartoons! And Beer! And Girls! Come on, it doesn't get much cooler than that. For two, she has, what I find very refreshing and often missing in beer writing (including myself), this great ability to completely ignore hype. In a four-panel comic she manages to do what girls have this innate ability to do and what guys, like me, can't seem to do for the life of us: be concise and manage to find exactly the right, most-efficient, way to provide intelligent commentary in a fun and amusing way. Me? I prefer to circumlocute and equivocate and find the most esoteric polysyllabic, multi-clause, rambling, indirect way to almost, but not quite, make a point in a manner that causes you bring into question my very competence at constructing an intelligible sentence. You will surely prefer her way of doing things. Finally, a dude blogger from Illinois who probably has too many credentials to be properly called a "blogger" - he writes for Beer Connoisseur and other fancy-pants magazines about beer. And gets paid for it! (I say, partly, in jest since I, myself have appeared in fancy-pants magazines and on TV and radio to talk about beer - that's right Mr. Connelly, I AM a multi-media threat; you should be very, very afraid for your job. Punk.) Anyway. For whatever reason, I've just stumbled upon his blog, though, I actually think I had found this blog a while ago, and somehow unsubscribed by accident, forgotten about it, and then just "rediscovered" it a few weeks back and think it's awesome. Anyway. The Beer Philosopher. Read it. No license or permit is required under this Chapter for: ... The manufacture of wine or fermented malt beverages of any alcoholic content by any person at his or her home, farm, or place of residence if the wine or fermented malt beverages is [ed note: sic] to be consumed by that person or his or her family or guests, and if the person manufacturing the person manufacturing the wine or fermented malt beverages receives no compensation. No tax is levied ... in respect to: ... Making of wine, cider, or fermented malt beverages at home solely for consumption therein and use thereof in such home by the family and guests without compensation. A homebrewer makes 2 5-gallon batches of beer at home and one batch is consumed (a) at home and the other is consumed (b) not at home (at, say, an art gallery where the homebrewer provided the beer for a private art-show by the homebrewer's wife). In neither instance would the homebrewer need to be licensed by the state. However in the second instance, the homebrew might be taxable (at $1 per barrel or about $.15 for a standard 5 gallon homebrew size), where in the first instance it would not. Strange result. So, what is the point in all of this? Homebrewing has become increasingly popular. So popular in fact that the Roster for the Madison Homebrewers and Tasters Guild, Milwaukee has multiple homebrewing clubs, and even towns like Sun Prairie and Mount Horeb have sizable and active homebrewing clubs. According to BBLodge.info (itself run by a Milwaukee homebrew club) there are around 27 homebrewing clubs around the state. As a celebration of this fast-growing hobby, the Great Lakes Brewfest in Racine, WI had held a homebrewing demonstration where it invited homebrew clubs to come and share their enthusiasm for homebrewing and serve samples of their brews. This has gone on every year, but this year the Brewfest got a message from the State of Wisconsin Department of Revenue stating that homebrew could not be served. Indeed, MHTG events have, not surprisingly, regularly featured homebrew (though not at the Great Taste of the Midwest). In planning events for Madison Craft Beer Week we had numerous requests for homebrew demonstrations. 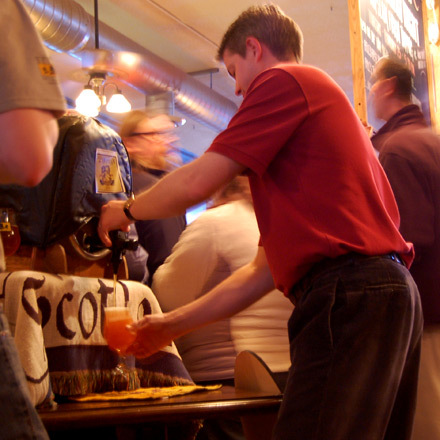 These requests, by places such as Whole Foods, The Madison Club, and The Malt House, resulted in consulting the Department of Revenue Alcohol Tobacco Enforcement Division for an Official Comment regarding serving homebrew in public places. The official position is this: You can serve homebrew at private events held at facilities that do not hold a liquor license. You can see how this reinforces the statutes, but seems to follow the more lenient licensing statute. It is not entirely clear what the tax implications would be since complying with the official position would technically allow you to serve homebrew outside of a home (e.g., at an art gallery) thus pulling the homebrew outside of the tax exemption. Admittedly, it would difficult to monitor and enforce such events and the amounts that could be recovered would hardly be worth the effort. In the meantime, homebrew clubs around the state are looking to band together to reform the laws to allow homebrewing demonstrations and serving homebrew in public places. This could be problematic since these are not government inspected or licensed premises or products. Though careful wording of waivers could help to alleviate some of the concerns. Moreover, common sense, and, frankly, quality, would help to mitigate any issues with "competition" that distributors might have. Finally, keep in mind - demonstrating how to homebrew is not against the law. Only serving the homebrew itself. Arguably, fermenting (what makes beer a regulateable "fermented malt beverage") cannot be done anywhere other than a residence, so public homebrew demonstrations might have to work-around that. But this is not the death of homebrew demonstrations, only the death of serving homebrew in public. If you ferment your beer in a refrigerator with an analog temperature controller, you may be tempted to submerge your controller's probe in water or rig up a system to base its feedback on your beer temperature. After all, it's the beer temperature that matters - not the ambient temperature - and measuring a liquid temperature will extend the life of the fridge by reducing the number of times it cycles on and off. Unfortunately, measuring a liquid instead of the ambient air will result in a loss of temperature control. Why? If you tell the fridge to turn off once your beer temperature drops below a certain temperature, say 68 degf, the air surrounding the beer will still be cold - probably in the upper 30s - and continue to cool your beer. Instead, you should control your air temperature to offset the heat generated by fermentation. For 5-gallon batches with healthy fermentations, ales tend to peak at 8-10 degf above ambient temperature while lagers peak at 2-4 degf above ambient. Your mileage may vary, so you should stick a thermometer strip on your fermentor to know for sure. Once your airlock begins to slow down, I recommend raising the ambient temperature to improve diacetyl reduction and ensure adequate attenuation. For ales, you can simply move the beer to a room temperature location. For lagers, I like to set my controller to the upper 50s and postpone lagering until the beer is fully fermented. Oh yeah, don't worry about cycling your fridge. It was designed to be opened frequently, thereby requiring a lot of cycling, and its internal temperature controller works the same way as your external controller. So, this is a first in MBR history. A reprint, or rather an edit of a post from an earlier date. This won't be normal here, but as I was contemplating writing an article about cask beer, I realized I had already written a really good one. What would prompt such a seemingly random, but apparently urgent, need for an article about Cask Beer you ask? I'm glad you asked. Madison Craft Beer Week is right around the corner, yo. And one of the events that MBR has had a heavy hand in producing (in conjunction with Dane 101) is a Cask Ale and Music Festival to be held on Thursday May 5 starting at 6pm. Here's the deal: 3 bands, 10 casks, and unlimited beer. For $25. Here's the deal. High Noon Saloon on May 5, 2011. Taps open at 6pm. Music starts at 8pm. For $25 you get a wristband that gives you unlimited sampling and amazing music from: Aaron Williams and the Hoodoo, Mama Digdown's Brass Band, and the Kissers. All perfect beer drinkin' music to throw you an All-American party. But, if you don't have a wristband, don't fret! Come on down and you can buy half-pints ($3) or full pints ($5) of any of the cask beers on tap. You can buy your $25 wristband at Brown Paper Tickets. This article is about why that's a ridiculously good price for beer that you can get few other places in Madison (to my knowledge, Maduro has the only regular cask beer). Edited from the Hey Barkeep! Article of August 28, 2009. First, it's important to get some terminology right. What does "naturally carbonated" mean? We've talked about ways to carbonate beer before (here and here). Basically, CO2 is a byproduct of the fermentation process, prior to bottling the CO2 from the fermentation process is let off into the air and the liquid stays flat. However, most of us prefer to drink carbonated beer. The two primary ways of carbonating beer are "force carbonation" and "natural carbonation." Beer is force carbonated by sealing the beer in a tank (e.g., a keg) so that air can't escape and force CO2 into the tank. The CO2 has to go somewhere, and the liquid absorbs it. When you open the bottle, the CO2 escapes and you get bubbles and head. Natural carbonation occurs by adding active yeast to the bottom of the vessel (either a bottle, or in this case a keg) and letting it eat some of the residual sugars (fermentation) and produce CO2 which gets absorbed into the liquid because it has nowhere else to go. If you see a bottle that says "bottle conditioned" this is what happened. Over time the bottle/keg will become more carbonated and (slightly) higher in alcohol. But there's a problem here that you may not have picked up. The vast majority of beer served on-tap in the United States (and throughout the world for that matter) is via a CO2-based tap system (or CO2/Nitrogen mix for you nitro nerds). Subjecting a naturally carbonated beer to a CO2 system would cause some problems (not the least of which is that all the yeast would be flushed out of the system in the first pitcher!) Thus, there are two types of Cask serving methods, which we'll talk about in more detail later: gravity system (where the barrel is tipped up and the beer is poured out of a tap physically located on the keg) and a hand-pump (which works a bit like an old water pump would). Bill Rogers, owner of The Malt House here in Madison, all-around genius beer guy, is a big fan of cask beer and one of the organizers of the Cask Beer and Music Festival. I agree, for the most part, with what Matt said on Monday about this. Goose Island has every right to sell its business and it isn't, in and of itself, a bad thing. Those of us who follow such things, and probably even those who don't, saw this coming a mile away. But, Goose Island's claim that this is a "capital" issue is ... to be frank ... a crock. Or rather, it's only half a crock because, yes, capital plays a part in this, but it's really a distribution/production issue. Goose Island had a problem - through years of focusing on its brewpubs and the Chicago market, it became third fiddle throughout the Midwest to Bells and Great Lakes. There is not much room in the market for two regional breweries and one quasi-regional that removes an entire state from the equation (New Glarus). So, for Goose Island to grow in the ways that it wanted to, it had to either take on Bells and Great Lakes head-on in a brand war, or it could take what it has in the Midwest and move on to bigger and better markets - namely, the rest of the known universe. This presents two problems for Goose Island: 1) how to distribute beer to the rest of the known universe and 2) how to brew enough beer to meet that demand. Goose Island could have done what Boston Beer did: go public, release stock for a big equity boost, invest in contract breweries across the United States, hire a bigger sales force, and go on its own. It appeared poised to start doing this through its explorations with brewing at Red Hook to serve the East Coast market. It could have done what New Belgium did and sell more stock to its employees keeping the company private, increase its local capacity, hire a bigger sales force, focus on distribution efficiencies, and go on its own. It could have done what New Glarus did: be content with the Chicago/Illinois market, get a loan from a bank, increase its capacity and be happy being the biggest game in a big pond. However, Goose Island's owner decided "I don't really want to deal with this" and leveraged a current business asset - a partnership with Anheuser-Busch - to meet his goals. AB/InBev is perfectly placed to solve the production and distribution problems facing Goose Island in its efforts to expand its brand outside of the Midwest. Moreover, this move doesn't dilute Goose Island stock or increase Goose Island's debt load. Indeed, AB/InBev gets a relatively lean company with an expanding brand and portfolio that it can leverage with its own breweries around the country/world to brew 312/Honkers/etc and leave the Chicago brewery to produce the high-end stuff. Moreover, AB/InBev already have distribution and sales networks established throughout the world that is just itching to sell real craft beer. * So, in one easy move, Goose Island expands its capacity and distribution without burdening the company to take that on. In my own opinion, the real test will be whether AB/InBev can leave well enough alone and let Goose Island make its own production choices. I'm not entirely sure I agree with Andy Crouch (I rarely do); I don't think the acquisition itself indicates that AB/InBev or Miller or Coors are suddenly realizing that others do craft better than they do. I do think it shows that they are open to this possibility, though. It is entirely possible that AB/InBev want to (or at least will) muck-around with the recipes for different markets, turn them fully into a corporate brand that has no distinct identity, and derail efforts to make truly "craft" beer like Goose Island has shown some interest of late in actually doing. This was the downfall of Leinie's vis-a-vis Miller. However, if AB/InBev can leave Goose Island to do its thing, then I think other breweries will see acquisition as a viable exit strategy to ensure long-term growth of a brand. And, if this can happen, we will start to see a lot (LOT) more investment in craft brewing. * We'll ignore for the moment that most of these distributors do, indeed, already distribute "real" craft beer - but it doesn't pay nearly as well (including above-table and, ahem, below-table deals) as A-B does. As you may be able to tell, last week MBR was on a bit of a hiatus. Two of us were out on vacation - one out west and points beyond and the other down south. Robyn has been posting about her travels, and she'll have some more posts for you about the nineteen breweries she managed to visit. I was in the south - specifically South Carolina. When I was last in that foreign country south of the Mason-Dixon, about 7 years ago or so, the South was, to say the least, a vast wasteland of craft beer. Abita and Sweetwater were about it for generally available craft beer. Heck, until about 2006 or so, I thought that Yuengling was a southern brewery because it was, in many cases, the only non-macro beer you could find there. That has changed drastically. Asheville, North Carolina was named America's best beer town in 2010. [ed note: Portland, OR ran a close second but, frankly, having been to both Portland and Asheville in the last year, I think Madison is right up there - we just don't feel the need to brag about it.] South Carolina itself has three breweries, two of which have opened in the past few years: Palmetto, Coast, and Westbrook. Westbrook is the newest of the three and Coast was started up by an ex-Assistant Brewer at Palmetto. Palmetto is sort of the "grandfather" of the bunch having started all the way back in 1994. All three make great beer. Asheville's brewing culture has exerted itself on the rest of the south as well. Duck Rabbit, Highland, and French Broad all have high availability throughout the coastal south. Charleston, SC is also a hotbed of craft beer in the south. All of the SC breweries are based there. Charleston Beer Exchange is, I kid you not, one of the best craft beer stores I've had the pleasure to step foot in. Tucked into a small storefront in the touristy area of historical Charleston, the place is chock-full of craft beer from all over the world - with bottle selections from breweries that are simply not available in the vast majority of "better" retailers. The wonderfully named "Closed for Business" beer bar was like stepping into a food-serving version of The Malt House with great, rare and excellent, beer from all over the country. So, fear not. Or, maybe fear indeed, the South. Craft beer is making in-roads that even 5 years ago seemed almost impossible. While we (I) may have had this vision of the south as Budweiser-swilling NASCAR lovers, the reality is that much of the gains being made by craft beer are being made in the South. Ten months ago, I wrote an article for Oshkosh Beer about using dry yeast. Since then, I've used dry yeast in four more batches. The results were mixed, but I've had a breakthrough of late: assuming that a typical gram of dry yeast contains 14 billion viable cells instead of 20 billion. Using that estimate for my latest batch - a Summer IPA fermented with Safale US-05 - resulted in 84% apparent attenuation (with corn sugar providing 5% of the extract) and a super clean flavor profile, even at 7.5% abv. Well done, dry yeast! Oh yeah, ignore advantage #4 from the Oshkosh post. I recently learned - or maybe relearned - that oxidation of alcohol isn't much of a concern. If it was, unsealed bottles of spirits would be far less shelf-stable than they are. Lipids and polyphenols, which are present in both wort and beer, are far more dangerous.